Is your website under performing, and can’t figure out why? If so, read on or call me now at 781-862-3126 for a free consultation. Optimizing your company website to generate traffic, leads and conversions is the first step in improving website performance, but there is more, much more. You will have to optimize your entire company eco-system across a number of dimensions that have unique SEO requirements in many cases. To start developing your SEO strategy you should develop a complete SEO Roadmap that includes the follow activities. Define your entire business eco-system. Identify social media assets and requirements. Understand the implications for the development technologies / platforms you use. Develop a sustainable content strategy. Conduct advanced keyword research – understand consumer search behavior in your market segment. Not a requirement, but very useful – understand how search technologies work. The above topics are outlined in a little more detail in the remainder of this article. This will help you develop a complete list of your company’s SEO needs, and focus your discussion with your SEO consultant. You should also consider why it is easy to fail at SEO. It’s not hard to get it all wrong. It’s important to develop a clear map of the eco-system that you operate in, so that you can extend your SEO strategy (especially linking opportunity) beyond your corporate website. This will include all your business relationships and other company owned websites. Micro-sites (e.g., custom landing pages for PPC). Business Partners (e.g., VARs, Partners). Business Providers (e.g., Consulting firms). Company Blog – content creation. Syndicated Media – content distribution. Company Twitter Account – engagement and promotion. Executive Twitter Accounts – engagement with a human face. Facebook Company Page – B2C conversations. LinkedIn Company Page – B2B conversations. Technology choices (e.g., inflexible CMS platforms where tags and pages are hard to edit). Web 2.0 tools (e.g., gratuitous use of Flash – especially as menus). Site maps (e.g., missing HTML and XML sitemap). URLs with meaningless character strings (session IDs). Information Architecture (e.g., excessive distance from the home page to important information). Coding Standards (e.g., source code elements can’t be parsed by the crawler). Validate Links (e.g., broken links – didn’t bother to validate codes and links before shipping). The money you saved hiring the cheapest web developer will be spent fixing the problems later. Your relevancy in search results. Without good content you can’t play in the game. Local Search Engine Services’ Portals and Directories. Individual People (board members, employees, consultants). Events / Link Baiting Content. Syndicate Content through Social Content Websites. These are good examples, but their are hundreds of other opportunities available to improve your linking footprint. Registering with vertical search services and directories. Submitting a XML-geo sitemap to Google. Remember, Local Search has it’s own Index, Crawler and Rules that dictate whether you can be included or not. Mobile content is found in a dedicated mobile search index. Mobile content is indexed by a different crawler. Mobile pages have dedicated markup languages (XHTML). Mobile websites require dedicated site-maps and meta.txt files. Mobile sites have stricter requirements for rendering existing content. Search engines will transcode websites if necessary. 20% of all consumer searches originate on a hand-held device. Content Management Systems (does it have foreign language support). Domain Name Strategy (.com vs. country-specific URLs). Language Issues (translation by locals vs. US-based translators). Identify country-specific search engines (there are hundreds of them). Understand the rules for getting into country-specific search engine. Webmaster Tools have foreign language rules and requirements. Keyword Research (e.g., can’t translate English keywords into another language). Regional Search Behavior – You have to consider idiomatic search customs. Regional Linking Strategy – Your US-based linking equity will not provide any value to your foreign language website. You don’t know what kind of problems you need to deal with until you know what is wrong or right with your current website. A site audit can range from a quick review of tags to a full analysis of how you stack up against the competition. 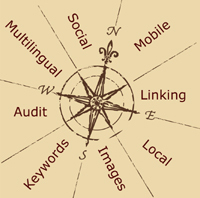 The following are the top areas for an SEO audit. Content analysis / Duplicate content detection. Link analysis (internal / external). Platform analysis (Web 2.0 tools). Product Requirements – Search behavior models provide extraordinary focus. Content Strategy – Search behavior model should be one of the primary variables in developing and deploying content. Information Architecture – Search behavior models provide you with an organizational strategy for website information architecture. SEO Strategy – The data in a search behavior model will drive your SEO strategy. Global Application – The insight gleaned from a search behavior model can be used to govern the management of your company’s social media initiatives. Advanced keyword research drives all aspects of your SEO strategy. Search relevancy & Page Rank impact search results. This is the best seo strategy blog. Great tips and trick that mention in this post. I really appreciated this post. Great guideline for doing seo effectively. Thanks for this useful information..